A pack of 5 Omni-directional PCB Mount Microphone Inserts. Ideal for audio detection circuits. Dia. 10 mm, height 7mm. Response 50Hz to 13KHz. Omni-directional PCB mount microphone insert. Dia 10 mm, height 7mm. Hi Emily, This microphone is designed to be mounted onto a PCB, the main issue is that a microphone will output a very small signal and for an Arduino to pick up this signal it needs to be amplified. 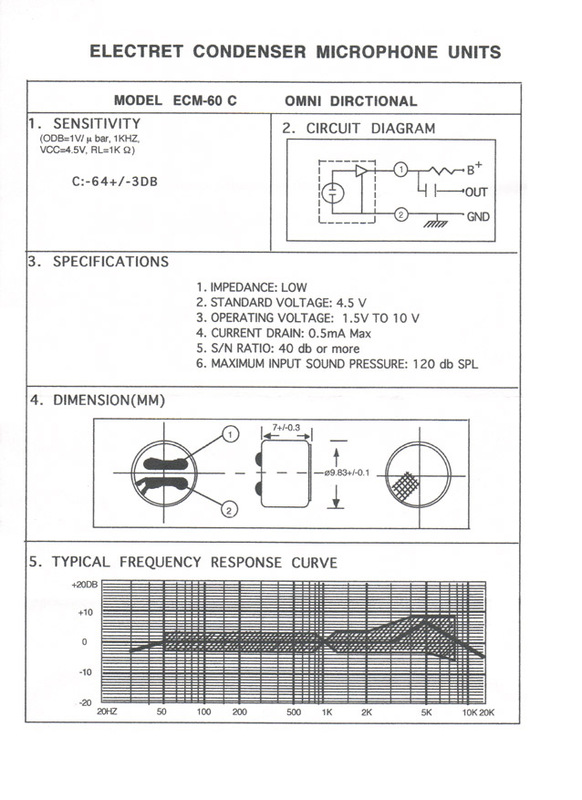 There is an article here which explains it in more detail, http://www.learningaboutelectronics.com/Articles/Arduino-microphone-circuit.php this might help you with working out if this microphone is suitable for your project. Q: Can the microphones be used to take in audio that could be stored on a computer? These microphones are designed to be soldered to a PCB. A: Yes the microphone would be fine. If you google clap detection circuit then you will get some circuits that can be used to generate a spike upon detection of noise, you then need to use an interrupt pin to trigger your code.